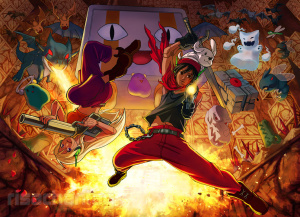 Indie legend Cave Story is coming to the 3DS eShop, along with a special 3D mode and additional content. It's out 4th October in North America, with a retail price of $9.99. Not to be confused with Cave Story 3D - the 2011 release which effectively rebuilt the game in 3D from the ground up - this digital download is an update of the original 2D version. As such, it will contain the 'classic' visuals but will add in a 3D effect which takes advantage of the 3DS' unique auto-stereoscopic display. The original 2D pixel-based Cave Story is officially releasing on the eShop as a native 3D game on October 4th, 2012 for $9.99! Additionally, Cave Story for eShop supports widescreen and original 4:3 modes, two button configurations and MORE Challenges! So no EU release date yet..? So its coming out so now ever one can stop complainning(in NA anyways)...for a few minutes and complain about some other games. Too bad owners of the 2d version can get a discount or something. I'm still looking for cave story 3d, not found it anywhere! anyone want to sell me a copy? I've waited for a bit now for this, but i'll see how good it is. I still havent played Cave Story. ._. I'm getting this, eventually. My question would be, do 3ds owners whom already have the dsiware version get it as an free update? @dirtyplastic how about you wait for this one? @TravelingD I want to ask the same question. Finally. Been holding out for a while now for this version. Bad, Good, Hell/True ending and Mimaga Mask is the 4th one . A free or cheap update would be really nice considering that i already own the regular 2D DSiWare version AND the 3DS version too. So is this one obsolete if you already have both of those? Cause even if its only a little different.... you know I will probably buy it yet again for a measly $10. hah. Bought. Can't wait to play the Wind Fortress finally! There better be an EU release date soon. We still don't have the DSiWare version and likely never will now. Finally! A release date! Now gimme unchained blades xSeed! Unfortunately, there's no discount for owners of the DSiWare version, like myself. If we want this version, we'll have to pay the full price. Thank GOD. The graphics in Cave Story 3D where so sickening. This is a day one buy, Never played a cave story title so this looks like a great start. Everyone needs 5 copies of Cave Story on the same system. @Azikira Curly's Story's been on the WiiWare and PC re-release, and all it is is the same game, but with Curly, who adds her own dialogue. and the original main character takes Curly's original role as the sidekick, and he's still mute. Anyways,10 unique weapons? Pfft. it's just the Polar Star, Machine Gun, Snake, Spur, Missile Launcher, Super Missile Launcher, Fireball, Bubbler, Blade and Nemesis. Nothing new. The real selling points of this--at least for us CS Veterans--are the Widescreen gameplay, 3-D, and basically having all the good stuff from Cave Story+ (except for the remastered graphics from the WiiWare) on a handheld. I think this (great) game has beat Lunar in terms of remakes and enhanced ports. Yeah, I got the dsiware version. Yeah, I'm really excited for this. Does it have Jukebox? It better! Now we just need nightsky's release date! Never played Cave Story before, so this is a must DL for me. Is this the 6th time they've remade the Cave Story game? Good stuff. My question is should I buy this? I have the cartridge, will I get anything extra for a digital version? Seems a bit expensive to me. How many times can they re-issue the same game with small alterations before people get wise to it?...... Oh...... erm..... Pokemon, FIFA, PES, Madden, Call of Duty, Mario, the list goes on. I'm losing interest in these games where they expect a high price tag. Small prices are fine. Full price is not. I've been wanting to give this game a shot for awhile now. Got my money. Been waiting so long for this, I really hope it comes to EU! @GumbyX84 Koolaid man still appears in all nicalis's translations. And guys, there are like 20 ports of the original SMB, so how is this worse? It would be cool if owners of the DSiware version could upgrade to this for 3.99 or something instead of having to pay in full. @TheDreamingHawk I think people are upset because of how frequent a new version of cave story comes out, and that nicalis has 3 or 4 other games [Programing Project from Pixel thats heading to DSiWare, NightSky, 1001 spikes, and the fighting game. Anymore?] promised, but only releases Cave Story. Since this has extra content and 3D,I guess I can get this. So there are three versions on the same system...? Hmm. Guess it's time i finally play one..
A. Nintendo sticks to making new games as well as porting. C. SMB has had 6 total ports from 1993 to 2012. Cave Story has had 5 over 2 years. I'll be honest, I'm kind of upset with what Nicalis did. Then, I got Cave Story 3D, which I did like, but spent $40 for a pretty much inferior version. And NOW this version comes out. I've already spent $60 on Cave Story, why can't this be a free DSi update? Or least cheaper for people who have that version? Well frack, I just picked up the DSi version on the eShop. Sounds like it's the same game, but still pisses me off it costs the same, but will A)actually fill up the screen and b) be in 3d.